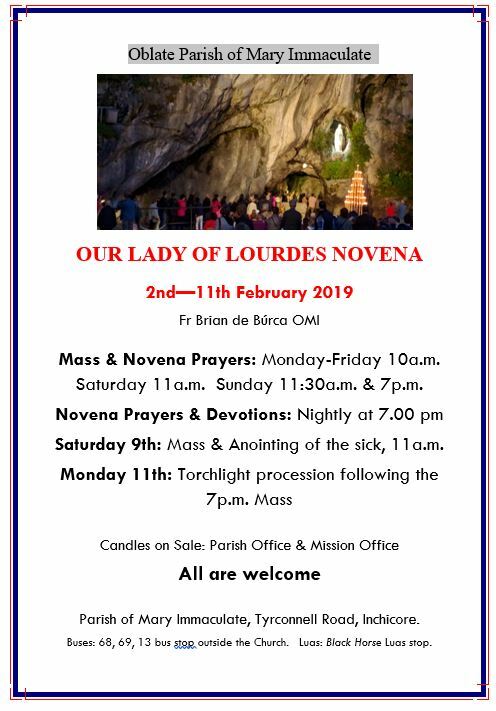 Our Annual Novena to Our Lady of Lourdes will begin in our Church on February 2nd at 7pm. The Novena will run each day until February 11th when we will have our Torchlight Procession around the Church. Each evening of the Novena a different Oblate will lead us in a Reflection. On Saturday 10th February Mass will be celebrated at 11am with anointing of the sick. Please note there will not be Mass at 10am or 12 noon on this day. 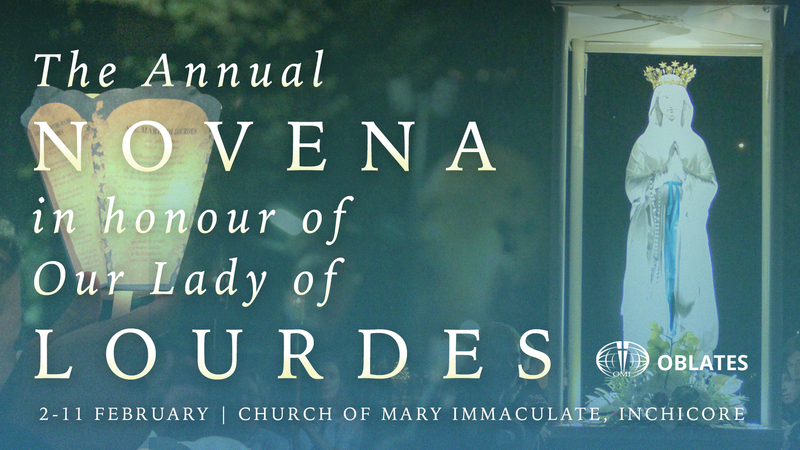 Monday to Friday: Novena Mass at 10am, Novena prayers and devotions at 7pm. Saturday: Mass with anointing of the sick at 11am on Saturday February 9th. Sunday Mass at 11.30am and 7pm. Torchlight Procession on Monday 11th of February following the 7pm Mass. All are welcome. The Lourdes Novena in Inchicore can trace its history back to a Belfast-born Oblate, Fr William Ring, the organiser of the first ever pilgrimage to Lourdes from Britain and Ireland. The year was 1883, and the experience was very different for those early pilgrims. They had to make their way alone or in small groups to France and on to the Shrine in order to avoid problems with the then anti-Catholic French authorities. Perhaps it was this experience that led Fr Ring to explore alternative ways to link people at home, those who could not travel, with the great (and distant) Marian Shrine. In the months prior to the pilgrimage, and with the assistance of a dedicated group of helpers, he wrote to the Vatican and all bishops in Britain and Ireland, informing them of his plans. The replies were so encouraging that he formed an association of prayer for the success of the pilgrimage. Tens of thousands enrolled in the association and were able to make what might today be called a ‘virtual pilgrimage’ through their prayer with and for the actual pilgrims. On his return to Inchicore after that first pilgrimage, Fr Ring suggested to Br Malone that they build a ‘Lourdes Grotto’ at Inchicore. The ruins of that early grotto can still be seen in the grounds. Work on the present Lourdes Grotto at Inchicore began in 1929. The brainchild of Fr Michael Sweeney OMI (1888-1964), this replica of the actual grotto at Lourdes was built with the help of local volunteer labour under the supervision of Oblate master-builder, Br Patrick McIntyre (1884-1963).